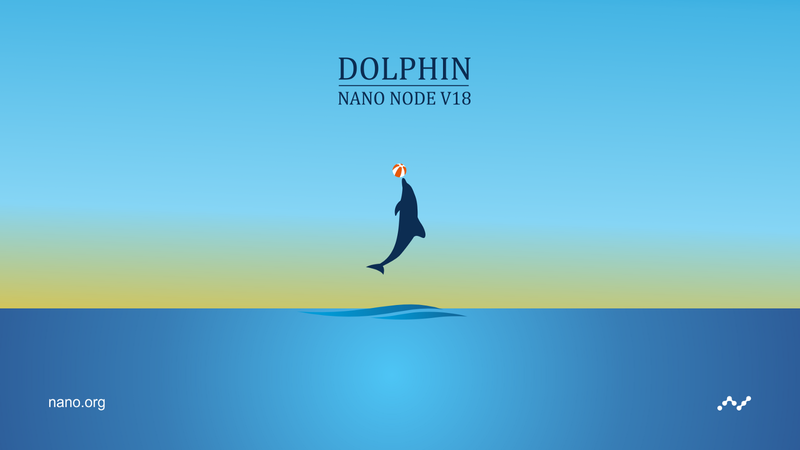 With the development work and beta testing now complete, we are excited to release the Dolphin V18 Nano node software on the Nano network. Charged with making the already nimble Nano network even faster, smarter and lighter, Dolphin accomplishes this through a selection of targeted optimizations. As with all protocol upgrades, the hard work of our community is key to the delivery of high-quality release. So we would like to take a moment to recognize and thank our community team of beta testers, node operators and representative owners who have helped ensure Dolphin is ready to surge onto the network and start making waves. We recently took a look into a variety of the more notable additions to the Dolphin release. We discussed improvements such as cached representatives and peers and support for additional local data. Check the Deep Dive for more information on the nuts and bolts behind what makes Dolphin the most optimized node to date. In addition to the many speed optimizations, Dolphin is making the Nano node even smarter by providing new tools for developers to integrate into their projects and services. Local timestamp tracking will provide a new standardized method of monitoring the time on all those Nano blocks, giving developers more time to spend on building robust applications on top of the protocol. With Dolphin, we bid farewell to the name that started it all — Raiblocks. The team has worked hard to implement such a sweeping change across the references, repositories, and codebase. Bringing everything in line with “Nano” represents a symbolic milestone in our journey. Raiblocks will always have a place in our collective hearts, but Nano will carry us into the future of digital currency. When upgrading a node to Dolphin, there will be automatic upgrades executed in the background. We highly recommend performing a backup of all your node data prior to the upgrade. To support key features the update process for existing nodes will involve heavy CPU and IO usage while the database is upgraded and rewrites all block entries in that process (this includes the desktop wallets). This will be done in the background while allowing proper syncing of blocks across the network but will consume a larger amount of system resources during the process. Due to the database upgrade, any ledger files updated to V18 will no longer be compatible with prior node versions. Please keep this in mind when planning any upgrades and managing any ledger backups. Directory renaming will occur with this release so if you are running a Docker setup please verify you are mounting any host volumes to /root in the container instead of /root/RaiBlocks and adjust files accordingly to prevent impacts related to this change. If you aren’t sure about the changes needed please join us on Reddit or Discord for assistance. In nano_lib the functions: xrb_uint128_to_dec, xrb_uint256_to_string, and xrb_uint256_to_address will null terminate the strings. Any APIs making use of these functions will need to accommodate this functionality. For a comprehensive list of all of the improvements in Dolphin, check out the Full Changelog on GitHub. Now that Dolphin has made its way onto the main net, it is time to shift our focus to the next significant milestone release of the Nano node software — Solidus. We are very excited to start talking about the great new features users can expect with the Solidus release, so keep an eye on our feeds for more updates! To keep up with the progress towards our next release, follow the Solidus Milestone Tracker.